Sunday May 10- 1931 Ott took me to church. The Whetstones to Burlington to get Birdie. Ott took me up there after we had been to the cemetery. Rose had a fine supper ready when they came at 5- oclock. Mr & Mrs Ensign. Ott Mr [Barber?] and I were there to recieve them. The party a surprise to Cora Birdie & Hattie. It was for her birthday Monday May 11- 1931 A showery day. [Ida] came and stated to lunch I wrote Mary Taylor in Los Angeles and to Winnie again about coming out every Friday. Read some. 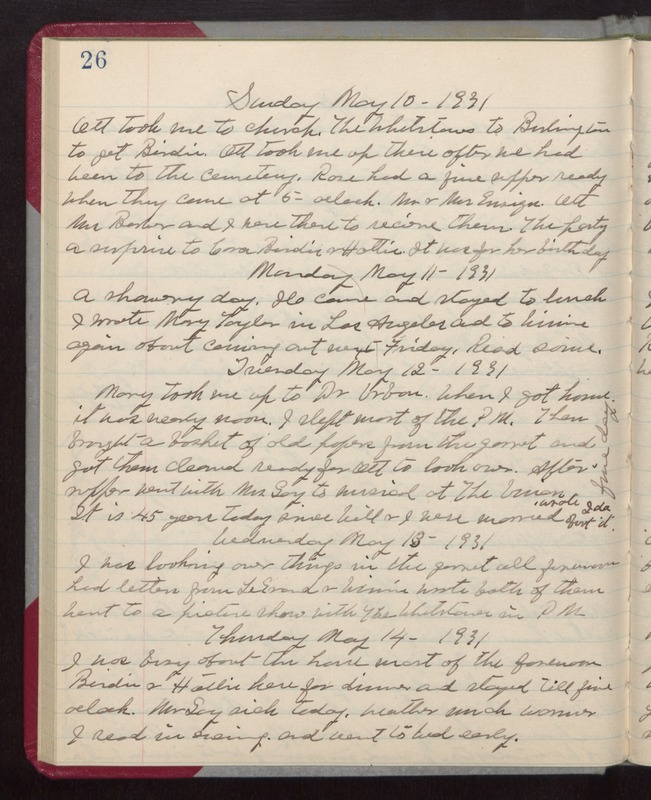 Tuesday May 12- 1931 Mary took me up to Dr Urban. When I got home it was nearly noon. I slept most of the PM. Then brought a basket of old papers from the garret and got them cleaned ready for Ott to look over. After super went with Mrs Gay to musical at The Union It is 45 years today since Will & I were married. wrote Ida about it. Wednesday May 13- 1931 I was looking over things in the garret all forenoon had letters from LeGrand & Winnie Wrote both of them Went to a picture show with The Whetstones in PM Thursday May 14- 1931 I was busy about the house most of the forenoon Birdie & Hattie here for dinner and stayed till five oclock. Mr Gay sick today. Weather much warmer I read in evening, and went to bed early.